If you love your Fitbit — like I do — but worry about it coming unhooked and falling off your wrist, fret no more. A fabulous Fitbit accessory to keep the clasp from opening and the device from falling off is available. 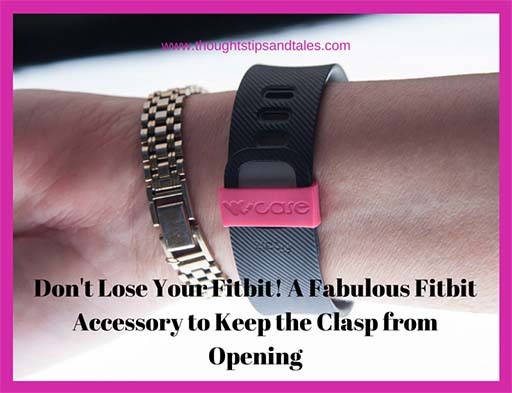 The WoCase Fitbit Accessory Band Fastener secures your Fitbit Flex, Force or Charge so you never have to think again about losing it. The fastener is a simple silicon band — about an inch across and less than half an inch wide– that you slip on the Fitbit before fastening the clasp, then slide back over the clasp to cover both layers after fastening it. A set of eight bands in various colors sells for $9.99, and you can change colors to match your outfits! A band lasts for about six weeks of daily use before it eventually rips. Get a pack today and own one in every color, or share them with your Fitbit friends (who will thank you). A friend gave me one and I’m glad she did! This entry was posted in fitbit, Fitbit accessory, Fitbit band, fitbit charge, Fitbit clasp, keep Fitbit from falling off, securing Fitbit and tagged avoid Fitbit clasp opening, avoid losing Fitbit, Fitbit accessory, Fitbit solution, keep Fitbit clasp from opening, losing Fitbit. Bookmark the permalink. Looks like a nifty little gadget for sure!